EASYDECK is easily stored with the wheeled storage dolly. This allows up to twenty five module frames and deck panels to be kept conveniently together, while also furnishing a ready method of transportation in and around the venue. 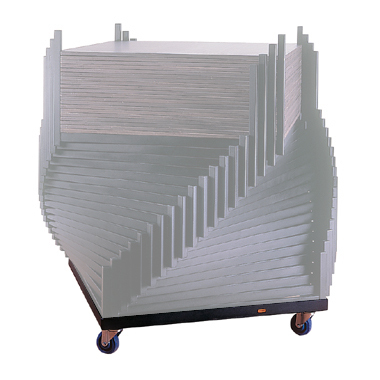 EASYDECK frames and decks are placed in a spiral upon the dolly, thus the storage space needed is minimal. For example; a floor area of no more than 1.2 square metres will accommodate a fully laden EASYDECK dolly.